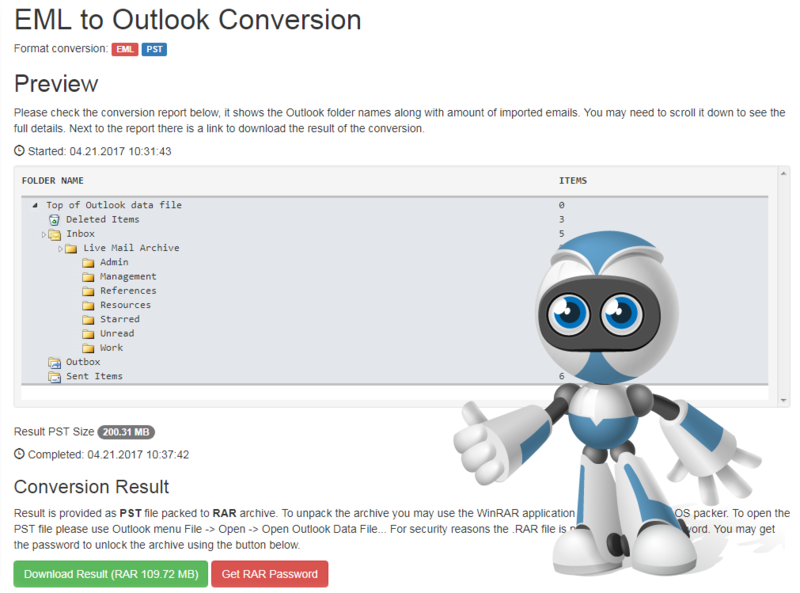 Hassle Free EML to PST Conversion Robot simply converts EML messages to Outlook PST format. Very small and simple in use tool doing everything authomatically using the Cloud converson. All you need is to pack your EML files and folders into solid ZIP or RAR archive and specify it's location. The Hassle Free EML to PST Conversion Robot will do everything else authomatically. As a result you getting the Unicode PST file including the nested structure of folders within imported emails. There is nothing more to say. If you looking for the hassle-free conversion of EML files to PST format, the Conversion Robot is what you need.